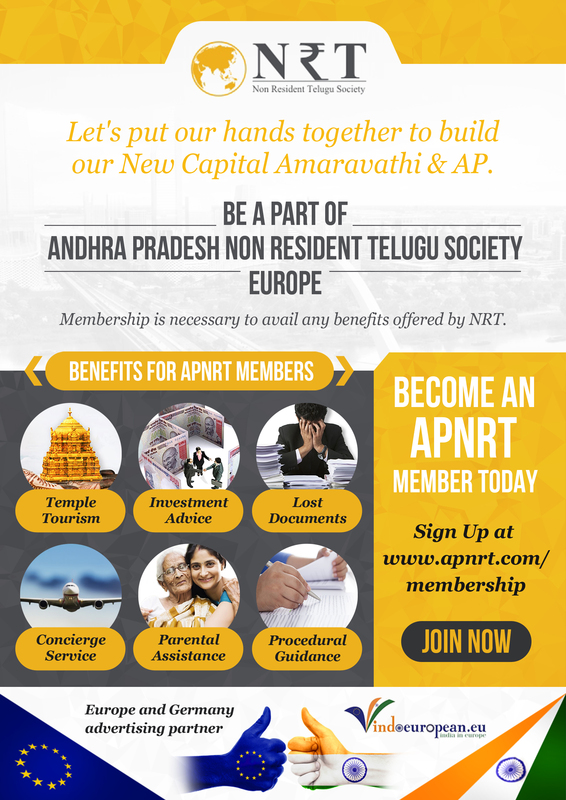 APNRT society is a 100% Government owned non-profit society established in May 2016 by Government of Andhra Pradesh, at the behest of Chief Minister of A.P, Mr. Chandra Babu Naidu garu to bring worldwide Nonresident Telugu community under one roof, to actively engage them to participate in the growth and prosperity of Andhra Pradesh and to serve their needs back home in India. What are the services offered by APNRT Society? Investment guidance: APNRT provides guidance on sector wise policies and incentives for investments in various industrial sectors in the state, framed by the government.Procedural guidance: APNRT will act as a lobbyist within the government to provide guidance to prospective entrepreneurs and walk them through the procedural maze as a single window till the desired milestones are achieved. Lost document (Property / Educational): Seek relevant proofs of ownership and forward request and arrange to meet relevant hierarchy of revenue department. Seek Follow-up / closure of issues raised. Guidance for issue of OCI/PAN/Aadhaar cards: We forward concerned departments application along with details whom to forward / what to attach. Venketeshwara Swamy temple at Tirumala. Varaha Lakshmi Narasimha Swamy temple at Simhachalam. Satyanarayana Swamy temple at Annavaram. Varasiddhi Vinayaka temple at Kanipakam. Bhramaramba Mallikharjuna Swamy temple at Srisailam. Kanakadurgamma temple at Vijayawada and Venketeshwara Swamy temple at Dwaraka Tirumala. What is SMART Village program? This is a Gov’t of A.P Initiative to have NRT’s participating in the development of the villages which they hailed from or have an interest in. Donates for his own village for a development work, matching grant shall be established from District corpus and work will be taken up by “nominee of donor” to establish development work. Can any NRI Indian register at web site www.apnrt.com? APNRT organization is created to specifically cater to the needs of Non-Resident Telugus of the residual state of Andhra Pradesh and the desirous member need to provide proof that that he/she is a non resident Telugu and residing in a foreign country. Proofs may include a valid driving license issued in a foreign country or a foreign passport or a government issued ID denoting a non-resident status. Why should I invest in India or Andhra? India’s growth rate has surpassed many other countries. Andhra Pradesh’s growth rate being more than India’s growth rate is a positive factor. Also the Rate of Return on Investment has been high in Andhra Pradesh. GDP@2074 Billion dollars in 2015. It is third biggest market in the world. Your deposits in dollars may fetch very little interest abroad whereas in India you can get positive interest and your investments can also help government to build infrastructure in India. What are future plans of APNRT society? Investment in real property form approximately 25% of HNI investors portfolio in India and we wish to develop big ticket world class infrastructure initiatives sponsored by APNRT, funded and owned by Nonresident Telugus through specialized investment vehicles. NRT Icon is one such project underway. Other projects of this nature include Industrial Parks and Commercial Complexes.Build Educational Institutions for children of Nonresident Telugu’s to be part of world class educational infrastructure in Andhra Pradesh. Develop platforms for Nonresident Telugu’s to float tenders / procurement contracts / job opportunities which can be availed by fellow Nonresident Telugus and business population of Andhra Pradesh.